Alan Scholl hands the bat box up to Mike Lucas. 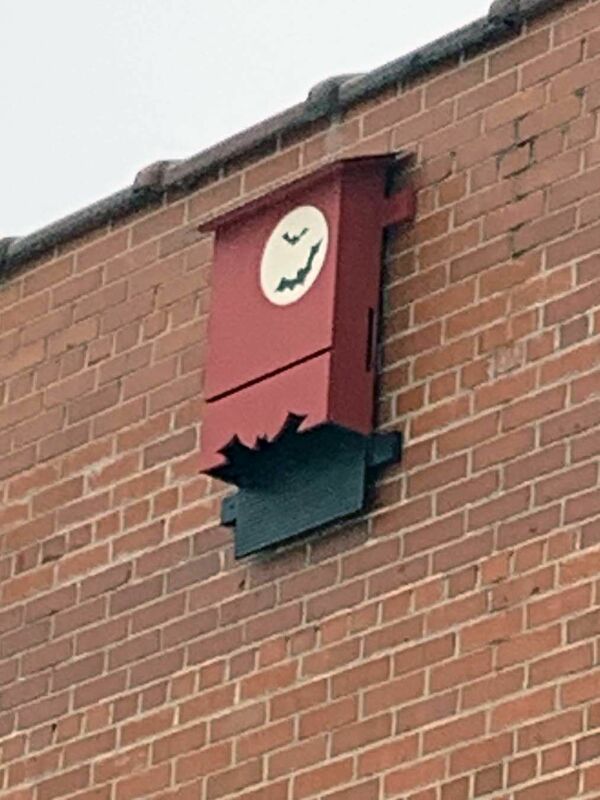 A colony of bats evicted from The McDowell News building last summer now have alternative housing thanks to a community effort that included craft beer, a generous donation and fine craftsmanship. On Saturday, Mike Lucas and Alan Scholl attached a 40-pound bat house designed and constructed by Lucas onto the north side of the Logan Street building, just a short distance from where bats had entered through a space around a vent and set up housekeeping last year. Marion resident Carl Dean first spotted the bats in May from Mica Town Brewing, which shares public parking with the newspaper. Because bats are beneficial – by some accounts they can devour as many as 1,200 insects in an hour – Hollifield thought it was a good idea to keep them in the neighborhood once they were out of the building. He approached Jason Snyder and Emily Causey of Mica Town Brewing about a fundraiser to build and erect a bat house and they were onboard. Snyder brewed up a special beer – dubbed Bat News Double Black IPA – with a portion of the proceeds going toward construction and installation of a bat house. LaVonne McClure of Rhinehart’s Saw and Lumber learned about the effort and wanted to help. Weather conditions and a few hiccups along the way caused some delays, but Lucas and Scholl, both seasoned veterans of the McDowell County Quilt Trail project, agreed to build and put up the house, a four-chamber box that Lucas said will hold up to 100 bats. “If they like it, they’ll raise their young in it,” he said on Saturday as he and Scholl began disassembling the scaffold. The color scheme of the box fits with the quilt block Lucas put on the east side the newspaper building a couple of years back. Anyone interested in a bat house of their own can call Mike Lucas at 828-443-6476.